When it comes to labels, toughness counts. 365 days a year. 24 hours a day. 7 days a week. Labels are everywhere, every day. The accurate identification of products is essential to the success of all manufacturers and distributors. Industrial labels, tags and tape have to perform well in demanding environments, providing critical product information and warnings amid years of tough conditions. At Northern Plains Label, our innovative approach allows us to offer high-performance marketing products that will meet any specification. You can rely on our knowledge, experience and proven solutions — so your high-quality, resilient labels last for years. Get your message across with printed tape. With Northern Plains Label, waiting for expensive, custom-printed boxes can be a thing of the past. Printed tape enables the safe flow of goods from your facility to its destination, which is critical to daily operations. It allows your package to act as a billboard, advertising your brand and elevating your image. The tape also acts as a theft deterrent, as cartons opened by authorized personnel are easily detected. Gummed, water-activated tape adheres to corrugated boxes even in dusty conditions and seals boxes with one piece, saving money. Protect your product identity with barcode labels and ID plates. Just like the products to which they are applied, barcode labels and ID plates must adhere to high performance standards at each stage as they are produced, received, stored and shipped. Metal name plates combine reliability with durability. They’re designed for products which require permanent, easily read identification and are available in many sizes and adhesive options. They can be custom imprinted, with or without barcodes. Northen Plains Label’s extensive knowledge of bar coding and ID plates will help meet your needs. Product Labels are Built to Last. Durable products require identification that will last the lifetime of the product. These labels must withstand environmental stresses such as vibration, heat, cold, moisture, UV, light, soap, grease and bleaches, and remain intact for the life of the product. Northern Plains Label provides label components that you can trust to perform in even the most challenging conditions. Pack it, stack it, track it with warehouse labels. Warehouse and distribution operations rely on marking labels to locate, manage and move products throughout the supply chain. 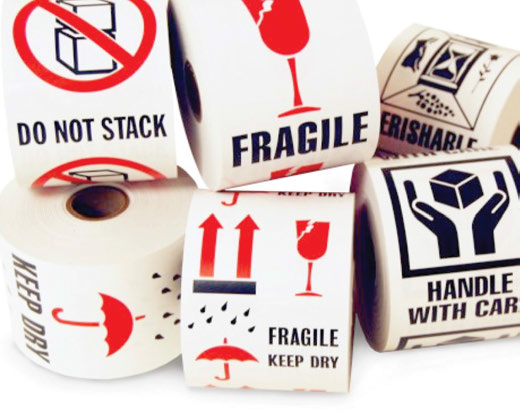 Distribution labels ensure your products are safely and carefully handled, stored and shipped. Saving costly returns and reducing stress. Northern Plains Label has a full range of labels designed for warehouse needs. Whatever you’re moving, you can depend on us for your marking needs. Get the hang of our tags. Tags are an efficient way to clearly identify items during the manufacturing, storage and transportation process. They’re easily seen, so they help reinforce your branding efforts. Whether they’re used for quality control, shipping or other applications, tags are a great option in agricultural, lumber, manufacturing, distribution and many other industries. Synthetic, tear-proof tags resist the rigors of cold, heat, wind, water, snow, UV light and chemicals, making them virtually indestructible. Northern Plains Label manufactures tags in multiple materials, colors and sizes — with or without wires — so you can choose the tag that works best for you. Contact us for more information about our industrial products.